The recordings by Greek violinist Alexis Zoumbas contained on this fantastic reissue are close to a century old, but they sound as though they could’ve been somehow broadcast from some pre-industrial age even further back. Of course, that’s not the case — in fact, the music here was captured not on some pastoral Greek landscape, but in New York City. But the evocative, mystical quality of Zoumbas’ playing takes the mind out of modernity and into the past. 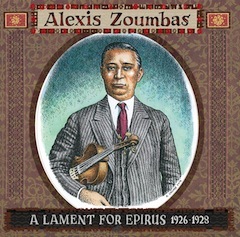 Lament For Epirus (named for the mountainous region in northwestern Greece where Zoumbas was born) was lovingly compiled, researched and remastered by Christopher King, a guy who seems to be a miracle worker when it comes to getting fairly astounding results out of ancient 78s. There’s some surface noise, naturally, but for the most part, it’s almost as if you’re getting a private recital, every note resonant and clear. Backed only by bowed bass and cymbalom, Zoumbas’ captivating, deeply emotional performances will stop you in your tracks. As the title suggests, much of Lament carries with it the heavy melancholy of exile, but it’s also infused with an irrepressible joy (indeed, many of the pieces here are meant to accompany dancing). Hard to believe that’s a 78 — it’s indeed a remarkable job of cleaning it up. Love the cover illustration, too. And, as always, I appreciate the wide range of music discussed here. I can’t believe after all these years these recording have been found. Alexis was my great uncle, I never meet him, but my Dad often talked of him. What a find!! !